This is Pewag's original design for security chain, which we have been selling for years now. It is surface hardened to 62 HRC Min. which makes it very hard to cut. 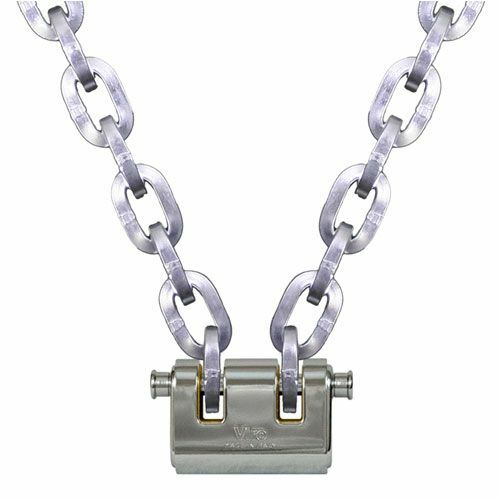 This chain is in the "sweet spot" in terms of size and toughness, being much bigger than the 9/32" chain yet noticeably smaller than the 1/2" 3012 chain. This chain is extremely hard to cut (check out our YouTube videos) and works well for all kinds of equipment whether on the jobsite or at home. For urban environments, you may want to check out the smaller 9/32" size (think bicycles). How Is This Chain Different From The 3012 Chain? For starters, the 3012 chain is actually a traction chain that was not originally designed for security--that does not make it any less formidable, however. The 3012 chain is also bigger at 12 mm in diameter. While this 3/8" chain is hardened 10% deep, the 3012 chain is hardened 6% deep. From a cosmetic perspective, this chain is silver while the 3012 chain is black. This is a true, high-security Viro padlock that was hand selected to work with this 10 mm chain. It has a fully armored brass body with tempered, copper, nickel, case-hardened and chrome plated steel armor. It also has a hardened bolt--this is a true security lock. Its size is just right, because it's beefy enough to look substantial and intimidating yet small enough to remain portable and easy to handle. The lock itself weighs just under 2 lbs.